Mom and I had a big adventure this week. Unfortunately we went on our adventure with nasty colds. On Wednesday we flew to Michigan. When we got there, Grandma and Grandpa picked us up. Mom lost her voice so she had to whisper my night-night stories. Because we were full of germs we kept a low profile. Grandma got sick with a tummy bug so she went into hiding with us. Mom took me to one of her favorite places called Turkey Roost. She tricked me into eating turkey by telling me it was chicken. 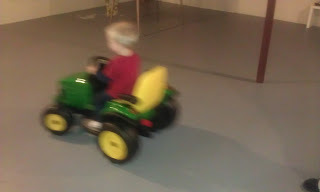 Grandma and Grandpa gave me a tractor. Once I figure out how to steer I'll really be zipping around the neighborhood in it. I enjoyed helping Grandpa put it together by handing him tools, including my favorite, the hammer. I also loved pretending to put gas in my tractor. On Saturday we finally felt mostly better. 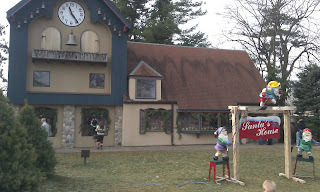 Mom and Grandma took me to Santa's House in Midland. His house is magic! 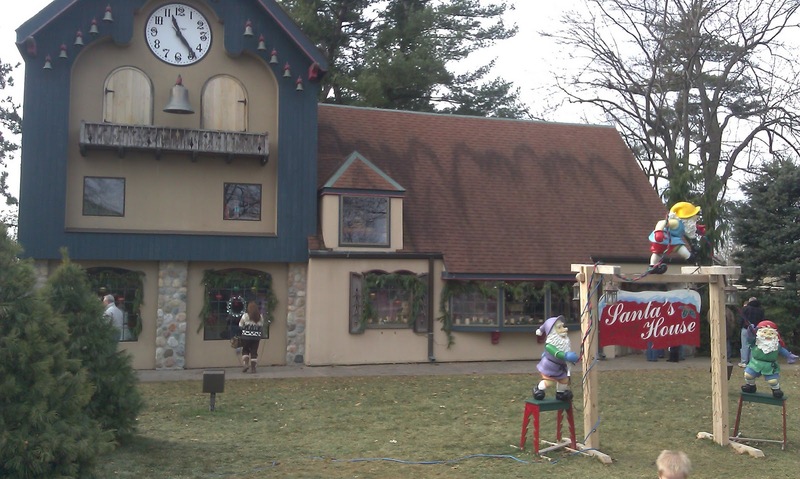 It is full of elves, trains, nutcrackers, toys, snow, airplanes, and so much more. 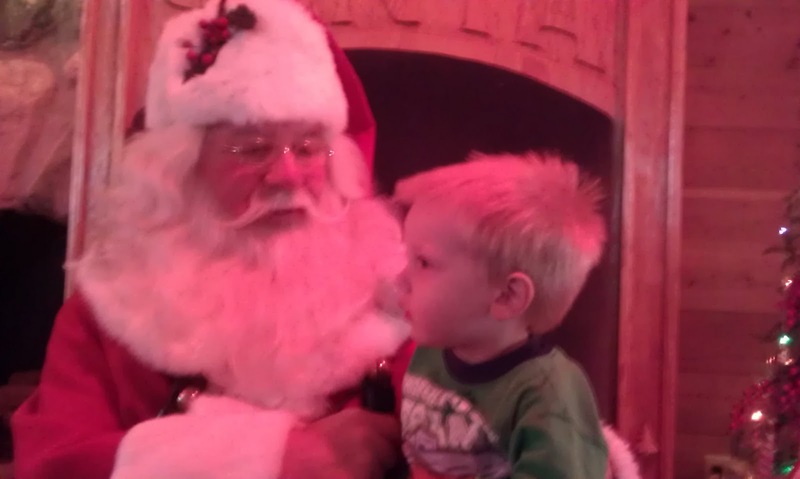 Mom was so proud of me for not crying on Santa's lap (this was my first time meeting Santa!). When we got to the end one of Santa's helpers gave me a puzzle with his house on it. We were surprised to see that Uncle Bob took the picture on the puzzle! That night we went to Matthew's 3rd birthday party. The house was hopping with kids. The theme was what I call "knock down birds" (otherwise known as Angry Birds). I really enjoyed helping Matthew play with his birthday presents. 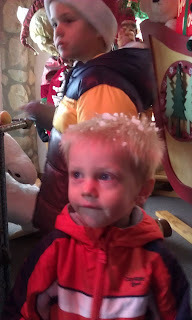 After the party we went to Meijer and while we were shopping it snowed. When we came out Mom had to brush the car off! The next day we went back to the airport. We had Taco Bell for dinner. I thought it was too spicy - yuck! When we got home, Dad was waiting for us in his red car. Hopefully we won't be sick for our next trip! Too fast to be captured by the camera! It snowed inside Santa's house! Alden met Santa for the first time! Isn't Santa's House cool? One of his reindeer was outside!